has to get the prior confirmation from the villu villa management. The following group types are not accepted by this hostel: High / Secondary School, Business Trip, Stag/Hen/Bachelor Party, Sports Group If you have misrepresented the type of group you are booking for, your booking may be cancelled by the hostel." 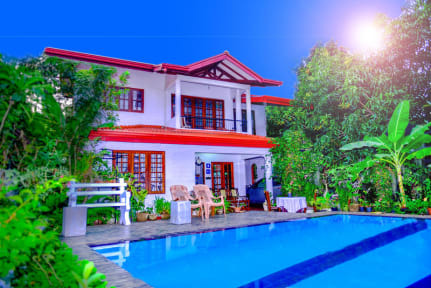 Well-positioned in the centre of Anuradhapura, Villu Villa is a family owned hotel, which will make you feel home all the time with an impeccable service. This boutique spacious yet cozy sojourn is owned by a prominent young lawyer with an established practice in the North Central Province. If you intend seeing the great places at Anuradhapura, Villu Villa is absolutely one of the best places to stay. With its ideal location, Villu Villa gives easy access to ancient ruins, vast water tanks and wild life the city has to offer. Nuwara Wewa the largest water tank in the city is just 500m away from the hotel. Due to its very close access to main road, a tired traveler can easily get back to the hotel after a long day of travel. The owner of the hotel is a lawyer by profession and he will guarantee 100% safety during your stay, short or long. The wife of the owner is in charge of the Hotel's kitchen and personally makes all food all by herself to ensure that each guest will be served with the best food of his or her choice. 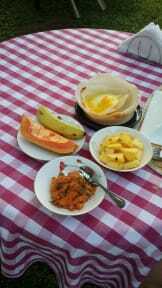 Villu Villa houses a restaurant which serves real Sri Lankan authentic delights alongside Continental favourites.